(Following a last minute cancellation, we offer a special discount for 2 weeks from 18 till 31 of august 2018). Villa Casita*** is a lovely and roomy provencal villa (awarded 3 stars by tourist office), surrounded by a mediterranean garden (250 square meters fully closed), in a residential area in Juan les Pins, at 10 minutes walk from the sandy beaches and shopping facilities. 3 toilets, 3 TV LCD, an American kitchen fully equipped (with american frigo and ice maker), a second kitchen fully equipped at the 1st floor, 2 dining areas, one lounge, TV satellite with DVD K7 player, high speed internet WIFI, hifi music (radio, CD, MP3, dock Ipod). Two baby beds, one baby chair and one playpen are provided : babies are welcome. There is air conditioning in all the villa. There is also a safe in the villa. Doors and windows are equiped by electric shutters. Private garage in the villa and one parking space outside. In the garden, below the trees (palm, orange, mandarin, olive) there is a summer kitchen with barbecue, refrigerator, garden furniture, and relax to enjoy outside life. A welcome pack (gift of french bootle of wine from Provence) for you at your arrival. Tourist documentations and a plan of the city are provided in the villa. fully furnished kitchen with dishwasher and many kitchen electric tools. We have just returned from a stay 14-21st May, group of 5. 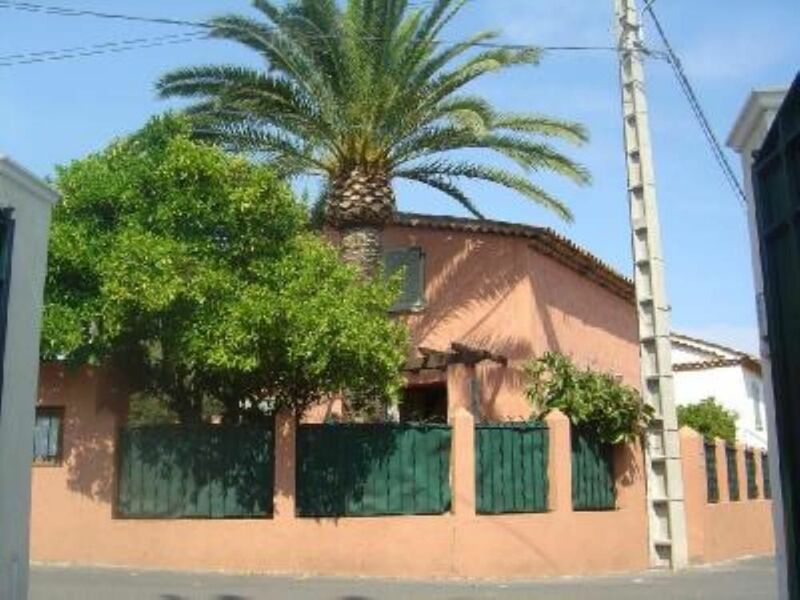 The house is located close to shops and very central for the area, ie for Nice, Cannes, Antibes, Frejus etc. Facilities here are first class, with a fully fitted/kitted kitchen with dishwasher, plenty outside furniture, washing machine/room and an outhouse with wood barbecue, sink, fridge and another dishwasher! There is a large screen TV in every most rooms, although these were hardly ever used by us - too much to do elsewhere. We had a great time, Antoinette came to meet and greet, no fuss, easy hand-over and we got our deposit back after a quick check-over by Philipe. It's a short walk to the beach area (10 minutes max.) and another 5 mins to the town centre of Juan les Pins, which is pretty lively especially at weekends. All-in-all it's worth a punt, and it's pretty reasonable too. Amazing stay at Villa Casita! Everything you need is there! Love the outdoor kitchen. Very comfortable and great location. Lovely walk to beach and town. Great service from property manager Celine. Highly recommended! "We have just returned from Villa Casita where we had a wonderful stay. Our kids loved the place and did not want to leave. THe sandy beach is within 10-15 minutes walk, mny lovely restaurant around, 15-20 minutes walk to the raolwaystation, from where you can travel to all the nice little towns along the riviera. Easy access from the motorway as well. Very recommended for families with little kids. We will sure return." "I''ve been enjoying my holidays in Villa La Casita for the last 4 years now. My evaluation can''t be better with a 5 in all categories. The property kept improving with the addition of air conditioning in the lower floor and a large LCD TV. I would definitely recommend Villa La Casita to everyone looking to enjoy a peaceful holiday in the French Riviera." "This place is wonderful. It really could sleep 8 adults comfortably. The villa is well stocked with dishes, linens, movies, etc!" (From airport : bus direct airport - villa, schedule on request). Bus sto within 10 minutes walk. Private airport transfert on request. The city is also certified with label Blue Flag Beaches. The Blue Flag is an exclusive eco-label which works towards sustainable development at beaches and marinas through strict criteria dealing with water quality, environmental education and information, and safety and others services. You will easily visit Cannes, St Paul de Vence, Nice, Monaco, Saint Tropez. Touristic documentation is provided in the villa. We will welcome you with a gift of french bottle of wine at your arrival. Also if you need anymore information, we will enjoy to be at your service. tarif dégressif en fonction de la durée, acompte/arrhes à la réservation, remise des clés par la propriétaire, caution demandée à l'arrivée selon contrat location.